Explore this map of Europe, the world's second smallest continent having 50 sovereign countries. The continent of Europe occupies 6.8% of the total land area on Earth. It has a rich cultural & historical heritage, and is also regarded as the birthplace of Western civilization – especially the ancient Greece. Europe comprises around 11% of the world’s population, as of 2016 census. 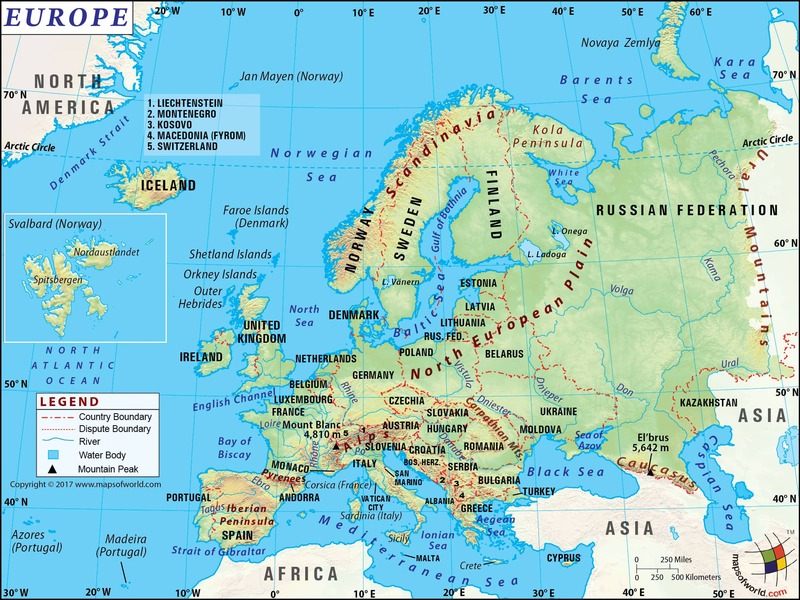 : The Map of Europe shows the countries located on the continent. The map notes the political boundaries of each nation and makes it easy to distinguish one from the other. Prominent rivers, lakes, and mountain peaks are noted and clearly shown on the map. The continents that border Europe, Asia and Africa are also shown on the map. Click on any European Country to get detailed maps and information. Europe is the second smallest continent in the world, spanning some 3,930,000 square miles. The continent covers 2% of the Earth’s surface. Europe is politically divided into 50 sovereign states, when the border is pushed eastward, adding Armenia, Azerbaijan, Kazakhstan, and Georgia to Europe rather than Asia. The geographical boundaries are hazy and have changed drastically throughout history. Based on cultural perceptions and political unions, the division between Europe and Asia is typically determined by the route along the Ural Mountains. Both Russia and Turkey have territories within Europe and have some of their areas are located in Asia as well - further blurring the separation. As of 2016, the population of Europe stood at 741.4 million. Russia's European section covers 1.54 million square miles, making it the largest country on the continent. Vatican City is the smallest and covers an area of just 0.17 sq. miles. Some important cities in Europe are London, Berlin, Paris, Prague, Copenhagen, Zurich, Madrid, Amsterdam, Moscow, Istanbul, Venice, Rome, and Vienna, to name a few. The most populated metros in Europe are Moscow, Russia, Dusseldorf, Germany, Paris, France, London, England, Amsterdam, and the Netherlands. The most popular languages spoken in Europe include English, French, Russian, German, Spanish, Portuguese, Dutch and Turkish. Europe was influenced by the Classical Greek culture of the 8th-century B.C. The powerful influences of the Roman Empire spread to Northern and Mediterranean Europe. The Romans had a profound impact on the growth of the continent's rich culture and architecture. After the collapse of the Roman Empire, the Byzantine Empire emerged and thrived (285-1450) in the eastern Europe. n Western Europe, several tribal groups assumed power, giving rise to smaller, faction kingdoms. The geography of Western Europe went through a major change. The Viking Age continued in Northern Europe from 8th to 13th centuries. The European colonial period, which spanned from the 16th Century, to the mid-20th century, saw European powers establishing colonies in Asia, Africa, and the Americas. The European colonial era came to an end with revolts in Africa, India, and the Middle East. The two World Wars caused severe damage to Europe, both financially and demographically. Have a look at our maps to see how Europe looked during World War I, and World War II. Two major events in Europe's recent history were; the fall of Berlin Wall (1989), and the fall of the Soviet Union (1991). The second-half of 20th century saw integration of several factions, and the establishment of the European Union (EU). The Ukrainian territory of Crimea, regarded as the common legacy of Russia, was forcibly annexed by the Russian Federation on March 18, 2014. You can still look for a comprehensive Timeline of European History. Europe is dotted with archipelagoes and islands. This includes the British Isles, Svalbard, Faroe Islands, Novaya Zemlya, Iceland, Franz Josef Land, Sicily, Cyprus, and Crete among others. Western experience a semi-humid continental climate, with cool summers. In Central and Eastern Europe, summers are warm, but winters are often harsh, with snowfall being a commonality. The 741.4 million population is distributed in the continent as: Eastern Europe- 292 million, Western Europe- 191 million, Southern Europe -152 million, and Northern Europe- 103 million. The Eiffel Tower - One of the tallest structures of the 20th century, is the well-known symbol of France. The Acropolis, in Greece - Is perhaps the most recognized ancient buildings in the world, located in the center of Athens. Sagrada Familia - A renowned attraction in Barcelona, Spain, it is a masterpiece designed by architect Antoni Gaudí. Notre Dame Cathedral - It is one of the best specimens of French Gothic architecture in Europe. The Colosseum, in Rome, Italy - This impressive building is a widely recognized landmark in Italy. Vatican City - T This continent’s smallest county is steeped in history and rich in artwork. Europe was the first continent to have railways and motorways. Belgium, one of the smallest countries of Europe, has the world's densest rail network. The busiest airport in Europe is Heathrow Airport (London, UK), followed by Charles de Gaulle Airport (Paris, France), Schiphol Airport (Amsterdam, Netherlands), Frankfurt Airport (Frankfurt, Germany), and Ataturk Airport (Istanbul, Turkey), in that order. The TGV in France, and the LAV in Spain, are world-class high-speed rail networks in Europe. The Channel Tunnel, or ‘Chunnel,’ that connects the UK with France, and the entire European rail system, was called one of the seven wonders of the modern world. Paris Metro, Madrid Metro, and Moscow Metro, are some of the best metro systems in Europe. A continent of great diversity, Europe takes pride in the assimilation of different languages, religions, and ethnicity. Most Europeans follow Christianity, with Western Europe being dominated by Roman Catholics, northern Europe by Protestants, and the southeastern Europe by Eastern Orthodox. For language, Russian has the most speakers, followed by German. The European Union uses 20 official languages. From Homer to Shakespeare, and George Orwell to Virginia Woolf, Europe's legacy of literary influence has been carried forward by generation of poets, dramatists, and novelists. With such an illustrious past, Europe has been the cradle of renowned musicians, filmmakers, painters, and architects. Over the last few millennia, the Renaissance, French Revolution, and Modernism, have shaped the political thinking of Europe, brought cultural and social enlightenment, and economic advancement. European Art has evolved through a series of eras, each showing a particular style. Some of the most known artistic styles that have flourished in Europe are; Classical, Medieval, Gothic, Renaissance, Baroque, and Modern. When it comes to European architecture, there are a great number of the Gothic churches and monuments spread across the continent. The bridges in Amsterdam, colossal Greek architecture in Athens, museums in Berlin, and churches in Rome and Paris are world renowned. Soccer (football) is the most popular sport across Europe. From the UEFA Champions League to the Spanish La Liga, many of the top football clubs around the world compete at these prestigious sporting events. Rugby, Cricket, and Ice hockey, are other popular sports that nearly every European country participates in. Europe has also hosted several summer and winter Olympics events on multiple occasions. Germany and France continue to drive the European economy. The United Kingdom has opted to exit the European Union, but will continue to remain an active participant of the European economy. Russia's economy is mainly driven by oil refining and defense manufacturing. Switzerland continues to be the focal country for banking and investment, followed by the UK, Germany, and France. With Brexit looming, London’s status as a financial hub is now being challenged by Frankfurt and Paris. In the manufacturing sector, Germany, France, Italy, and Sweden lead the way in their respective areas of dominance. France, UK, Germany, and Russia remain dependent on a growing defense industry. One must have thought that Eiffel Tower or the Big Ben would be the most visited destination in Europe, but it is in fact, Disneyland, in Paris. Thingvellir National Park of Iceland, one of the UNESCO World Heritage Sites in Europe, was home to the world's first democratic parliament. Despite being relatively small, it is the third most populated continent, after Africa and Asia. Mount Etna in southern Italy is Europe's largest active volcano. Renaissance and Industrial Revolution- had a significant impact on the world, and Europe was the main location during the period. Over the years, the boundary of Asia and Europe has changed significantly. Europe has witnessed some of the largest and powerful empires, for example the Roman Empire and the British Empire. Over 250 languages are spoken in the continent. Istanbul is the largest city in European continent. Greenland is closer to North America in proximity, yet it is considered European. The reason is that it is a dependent territory of Denmark – a country in Europe. The oldest country in Europe is Bulgaria – as the name has not been changed since 641 AD. What are the Major Mountain Ranges in Europe?